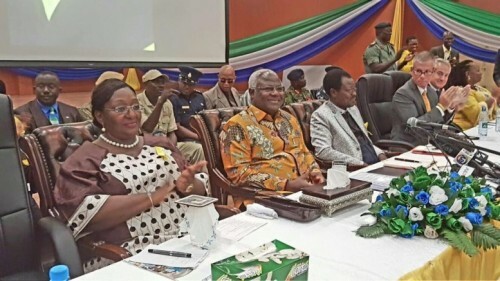 Many Sierra Leoneans in and out of the country are today questioning whether it is indeed appropriate and in good taste, for sections of the society to be celebrating the end of Ebola in a carnival like manner. 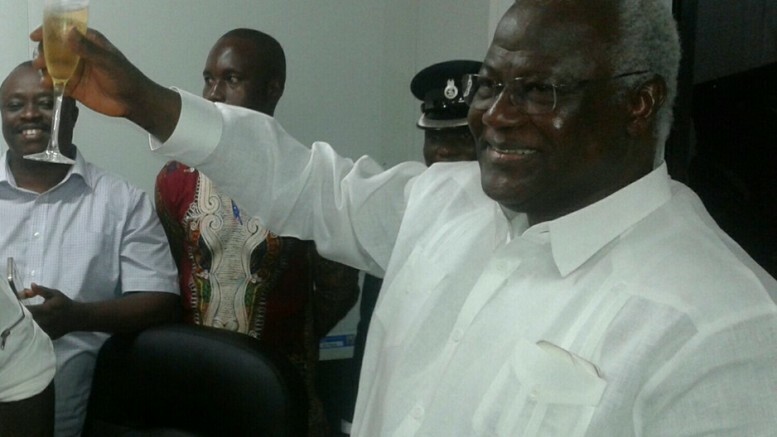 (Photo: President Koroma toasting to the end of Ebola with a champagne forgetting the tears of those that have lost their loved ones). They say that the declaration today of Sierra Leone achieving Ebola free status by the WHO, ought to have instead been recognised as a major milestone, dedicated to the memory of the more than 4,000 people that have died of the virus – including the twelve doctors and more than 200 other health workers, and their loved ones that are today mourning their deaths. Sierra Leone is a nation that is full of paradox, which is making it all the more harder to adopt a sober and measured response to matters of national importance, solemnity and decorum. Few civilised nations in the world would think of marking the end of a devastating national crisis or war with a carnival. But in Sierra Leone – we just did, out of poor taste to the memory of the dead and for the benefit of our own selfish ends. By the Grace of God and the resilience of ordinary Sierra Leonean men and women who suffered extraordinary tragedy and ultimately persevered, I welcome the government’s declaration today that the Ebola nightmare is finally over in Sierra Leone. All credit goes to the ordinary citizens on the ground who bore the brunt of this pestilence that ripped family and community apart, and indiscriminately took away young and old alike; and some of the best, brightest and noblest of Sierra Leoneans who showed amazing courage, and are now our collective heart’s pantheon of heroes and heroines in everlasting memory. The doctors, nurses, burial teams, volunteers, and everyday people, who rushed in to stop the fire when the house was literally being burnt down by Ebola, as the government dithered, having been caught flat-footed in the initial onslaught of the disease, are the true heroes, who history should never forget. (Photo: Alie Kabba). They are the ones whose profiles in courage should sensitize us all about true patriotism, bravery and humility. This victory belongs to the common man and woman in Sierra Leone. Our politicians and bureaucrats should be humbled and appreciative of the opportunity to finally stand up and do the job that they were hired to do by the people, after being initially blindsided and sandbagged by this terrible disease. Doing the job that you are elected to do is honor enough for every politician. I would like to believe that the government will do the right thing and honor the memory of all those who were felled by this disease, and allow them history’s shine, without any need for narcissistic grandstanding. I pray that we all learn from this tragic episode, so that medical terrors such as Ebola do not catch us unprepared in the future. In this regard, I propose a functional and integrated national public health infrastructure that will strengthen our capacity to contain and prevent the spread of another major health emergency. I also implore the president and his team to do proper accounting of Ebola funds that credible local and international reports affirm were misappropriated. The corruption around those funds and the stench of impunity surrounding that episode is a factor that may have unnecessarily prolonged this disease and its horrendous socioeconomic ramifications. 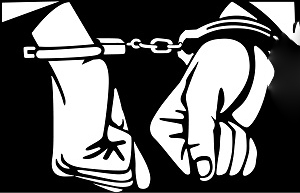 Let’s do a proper and transparent investigation so that such behavior will never happen again. Such an action by the president is one that will be truly worthy of emulation. I thank the international community, including African and Cuban medical personnel, for their support. They all served with distinction to save lives and prevent further spread of the disease. 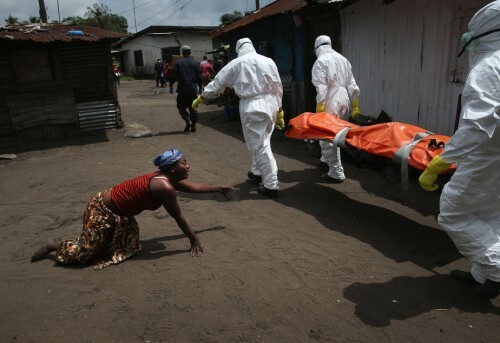 Many perished in this Ebola nightmare. May God welcome them in Heaven and continue to give succour to their grieving families and friends. Some of these wonderful souls will be anonymous to future historians, but their memory will always be evergreen in our hearts where light perpetual will shine on them. May their souls rest in perfect peace! Amen. It is pathetic that, with the exception of Alie Kabba, opposition politicians in Sierra Leone have failed to hold the government accountable for the missing Ebola funds. They seem to enjoy the distraction of attacking each other instead of focusing on government misdeeds and incompetence. I would have remained pessimistic about the future of my country if Alie Kabba had not entered the race for president. He has demonstrated courage, honesty, consistency and integrity throughout his campaign. His voice is a ray of hope in an otherwise barren political landscape. He is a patriot who is passionate about social justice and human dignity as he was when he was a radical student leader fighting against APC one-party dictatorship under Siaka Stevens. I am glad he is back to give our corrupt politicians a run for their dirty money! Needless to say, I will vote for Alie Kabba regardless of which political party he chooses to represent in the next presidential election. We have a leadership deficit today. 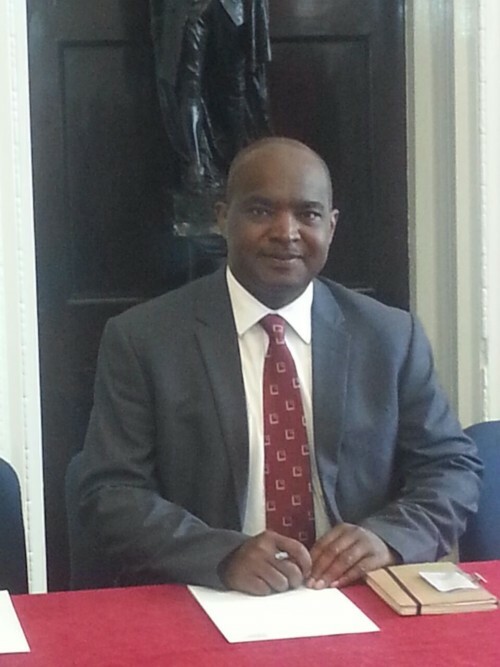 Alie Kabba is the antidote to the paralysis of leadership in Sierra Leone. Listen to the man, and you will never feel the same again about how you see yourself in the struggle to take our country back from the kleptocrats in power – those corrupt politicians who don’t care about the welfare of ordinary Sierra Leoneans. I see them everyday from Kono to Makeni to Freetown and everywhere in the country in their expensive vehicles. Their greed has blinded them to the suffering of the people! God’s wrath will fall upon them when Alie Kabba is elected as our next president. I am sure there are other good candidates for president out there, but none comes close to Alie Kabba. That is the plain, honest and undiluted truth! May I say thanks be to God for this November 2015. Last November 2014, we were all saddened and crying from knowing that hundreds of Sierra Leoneans were contracting Ebola on a daily basis. It was a terrible time. Last November 6 doctors died – some within days of each other. It was a trying time. As Dr Aboud (FRCP) said, Dr Willoughby was a great loss to the nation and he should be recognised for his services to the medical school and services in Sierra Leone. Looking at the comment from Mohamed Koroma about Dr Rogers, it makes me ask how many more were misdiagnosed with Ebola? How many more could have survived but were taken to the treatment centres erroneously? How do wives, husbands, friends, children etc move on knowing this terrible truth……that their loved one had a condition that was treatable? Who do they ask for answers? The British came to our aid, and I know that in the latter part of 2014, they were completely overwhelmed with so many cases, but it is also criminal that a wrong diagnosis could have been made. If this happened in Britain, heads would roll and someone would surely account for this mistake – crisis or no crisis. In the midst of all this calamity, Ebola funds were being stolen and mismanaged by government officials. So when I see celebrations with champagne to mark the end of 42 days of Ebola, it leaves a bitter taste in my mouth. If you have a death in the family, it is solemnly observed and remembered. These were hundreds of deaths and they should be remembered with prayers and not parties and outings. May the souls of all doctors, nurses, other healthcare personel and citizens who perished during the Ebola outbreak rest in peace. Mr. Kabba says it all and this is very courageous to the ordinary, hard working man and woman in our country. Of course we are glad that this monstrous disease has been ‘eradicated’ and we as a nation should look hard and deep in order to make sure that things are put into place for any future mishap; touch wood and we should not be complacent but rather change the entire health structure of our country. We have been robbed of our fellow brothers and sisters, some great service men and women who in the line of duty lost their precious lives. Today should not be about carnival like celebrations; today should be about looking back at what went wrong, how the government handled the whole catastrophe. Government should indeed give not only accounts of all EBOLA funds but should at least provide the necessary support to families of those who lost their loved ones during these trying moments. For a small nation, our country’s powerhouse should be able to demonstrate leadership and direction in times of any crisis especially crisis of this magnitude. As a people let us rise and fight this war of discrimination and self centerdness for the few. Let us unite as a people to foster our ambition to unfying our people. From the North, South, East and West let us sail through all tribal and regional barriers and say ENOUGH IS ENOUGH and forever we WILL NOT fall into the inveigle of failed politicians. I am still not convinced that Dr. Thomas T Rogers (TT) truly died of Ebola as was claimed by the British medical team at Kerry Town treatment center where he was transferred from Connaught hospital to face his untimely death. What I know and perhaps convincing to me is that Dr. Rogers was a diabetic patient who fell ill of same when his sugar test went up to 29, i.e. prior to his transfer to Kerry Town. On the morning of his admission at Connaught, his son Dr. Baimba Rogers called me to report that his father was unwell at his off Wilkinson Road residence and that he wanted me (being his close friend and brother) to go over to convince him to go for treatment as Dr. Boima had already arranged bed at the annex at Connaught. On arrival, I found TT in bed with his wife sat by him almost in tears for her husband. I went closer to him but I noticed he had high temperature so I told him I was there to take him to hospital for treatment. At one point he told he was not going anywhere. He said to me he can treat himself far better than any other doctor. He actually told me that his sugar test result had not been satisfactory over the week but will control it himself. However, I eventually was able to convince TT to go to the hospital. I actually took him from his bed, held his hand and lead him to the car and drove off for Connaught. At Connaught, he was examined by a doctor who prescribed him some drugs to bring down his sugar level. At Connaught he vomited and passed urine profusely. A male, white doctor associated the vomiting and urine with diabetic conditions and kidney issues as well. He actually told me that this condition was common with diabetic patients. Taking him to Kerry town treatment center, we did a follow-up inquiry from the medical team at the center the same evening. There we were told that TT had proved positive of Ebola but was responding to treatment very well. The team told us that TT was suffering from Kidney problem and that with or without Ebola his survival was crucial because of the Kidney. When I inquired whether they could do something about his kidney condition the response was negative. This was because they had no provision to treat any patient with such condition. I was personally disappointed by this response from such a high profile so called doctor from Britain. We however returned to Freetown with no guarantee of TT surviving. The issue of my argument that TT did not die of Ebola is based on the fact that all those patients that TT operated on, all his staff at his clinic, his wife who was with him, his children who lived with him and even me who was handling TT, vomiting all over me unprotected have shown no signs of illness to date. I am therefore certainly not convinced that TT died of Ebola. Dr Victor Willoughby worked with me and I later handed him the practice at 5 Lightfoot Boston Street.He was a brilliant doctor and he contributed a lot of energy and time to the Medical School for which he should be remembered for posterity. Sierra Leone has lost a great doctor. Money did not enter the equation with Victor. May he rest in peace. Well we give thanks to Almighty GOD for accepting the works of all those who have been struggling to defeat the Ebola crisis, especially the courageous MEDICS who lost their lives . They have won the battle for PARADISE, I pray. Now the most justifiable celebration which Government is going to make, in my view, is the compensation of the Families of the 4000 lives lost as a result of its monumental recklessness, which shall follow some of them to their small and shallow graves which shall open to the bottomless pit of hell. Perhaps it may be wise for them to vomit the so called stolen funds as this is the only way the LORD will bestow his mercy upon them; if they actually ‘mathneh’ (callous theft) the EBOLA FUNDS.